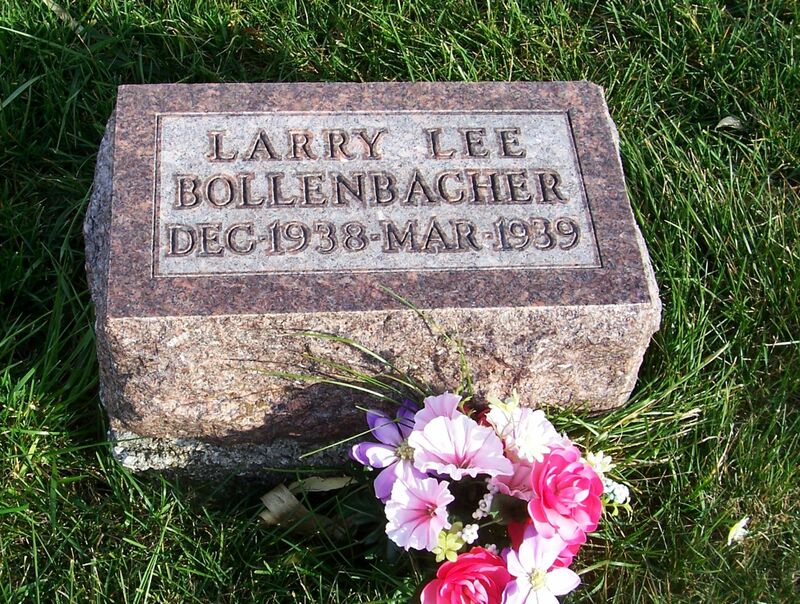 Larry Bollenbacher was baptized at Zion Chatt on 19 February 1939 with Luther Egger and Kathryn (Graham) Egger serving as his sponsors. Indiana, Birth Certificates, 1907-1940, Larry Lee Bollenbacher 22 Dec 1938; Ancestry.com; Indiana State Board of Health, Indiana Archives and Records Administration, Indianapolis, Indiana. “Ohio, County Marriages, 1789-2013,” database with images, FamilySearch.org, Ralph H. Bollenbacher and Catherine P. Maxwell, 1 May 1938; Fulton County Marriages Vol. 15, p.441; FHL microfilm 1426360. Indiana, Death Certificates, 1939, Roll 3, Larry Lee Bollenbacher, 25 Mar 1939; Ancestry.com; Indiana State Board of Health, Death Certificates, 1900-2011, Indiana Archives and Records Administration, Indianapolis, Indiana.